Mismaloya si trova a soli 5 miglia a sud di Puerto Vallarta al largo di Hwy. 200, la strada principale lungo l'oceano. Ristrutturato nel 2009, condominio con tutti i pavimenti in marmo in tutto. Cucina completa, aria condizionata, telefono, fax, TV satellitare, governante, gestore di proprietà / concierge in loco, posti a sedere in sala da pranzo 6. Una camera da letto (letto king size e 2 lunghi divani-letto matrimoniale) e 2 bagni - questo lussuoso appartamento per 4 persone. Una splendida vista dal balcone a figura intera attende la scoperta dell'oceano, della spiaggia e della giungla. Dal tuo balcone puoi vedere il set del film 'La notte dell'iguana', vedere i tramonti, osservare le balene e nutrire i pesci dai colori vivaci della barriera corallina sottostante, il tutto mentre sorseggi quel margarita fresco e rinfrescante. È possibile noleggiare jet ski o andare parapendio dalla spiaggia. Esplora la giungla sopra Mismaloya dove è stato girato il film "Predator". Ristoranti in loco, palestra, tennis, un sacco di attività - 8 campi da golf, zip line, giardini botanici nelle vicinanze, zoo e numerosi ristoranti a Mismaloya. Activiites Galore: affitta una panga (piccola barca) da una guida locale per viaggiare nell'area o andare a Yelapa. Questo complesso condominiale confina con l'hotel 5 stelle La Jolla de Mismaloya. Sia il condominio che l'hotel sono stati costruiti dallo stesso team di progettazione. Ci sono 5 ristoranti nell'hotel e altri 3 ristoranti raggiungibili a piedi. Uno dei ristoranti vicini, 'Tony's', si trova in una casa sull'albero con una splendida vista sulla baia di Mismaloya. Il complesso condominiale La Jolla de Mismaloya dispone di piscina privata, jacuzzi, palestra, tennis e un ristorante privato presso la piscina del condominio. Non avrai bisogno di un'auto, dato che c'è un buon servizio di taxi e autobus in città. L'autobus si ferma nelle vicinanze di fronte all'ufficio del condominio. Grande pesca, snorkeling, surf, vela, equitazione, kayak, immersioni subacquee (vedi i raggi di Manta), zoo, escursioni a baldacchino con zip line e passeggiate sulla spiaggia. Condo completo - tutto il necessario: cucina completa, TV satellitare, telefono, fax, servizio di pulizia, gestore di proprietà / portineria sul posto, comunità chiusa, piscina, ristorante a bordo piscina, palestra, tennis. Altre attività: Inviamo un opuscolo di 65 pagine con informazioni sulla zona. River Swim in the Jungle. Molte zone di seduta intorno aree piscina e lounge esterne. Spa e piscine in comune. Ristorante / bar privato in piscina. aperto da novembre ad aprile. Ristoranti nel villaggio di Mismaloya, aperto tutto l'anno. Lavatrice e asciugatrice nella zona comune. Governante prima e dopo il soggiorno, più una volta durante il soggiorno, con un minimo di 7 notti. The pool area is a great place to spend reading a book and checking out the action in the bay with boats coming and going. The wifi in the condo unit goes in and out. We ended up using the wifi for the condo association since it was a little more reliable. FELT LIKE 'COMING HOME' !! Just back from another great stay in La Jolla De Mismaloya Condominio. We were warmly greeted by 'staff' and our condo felt like home.....The extensive exterior renos started last spring have been completed and look great. Well done! The flowers and plants, in general, were lovely. A big Thank You to Jose! Approx. 2-3 hours per day were spent on our balcony, with our binoculars in hand and camera at the ready.....getting reacquainted with the resident iguanas, fish, birds and beach life! Always something to watch or check out. The Mismaloya Grill gets better every year; thank you Pablo & helpers. Local bus fares have gone up 2 pesos to 10 pesos per ride; still a good deal if you don't have a rental car or want to take a taxi. Not much 'negative' to report but really would like to see Recycling include more than just beverage containers and paper! Baby steps. Internet service continues to be sporadic but English- speaking TV (for news junkies like my hubby) more than compensates! A couple of suggestions, in general, especially for Canadians. ATM machines offer good rates for Cdn $$$ to Pesos, so no need to go overboard prior to your trip. Also, always pay in Pesos. It works out to be a far better deal, in the end. A big thank you to Amy for handling our rental. She's always prompt with answers to questions and/or requests. All in all, a wonderful experience if you're wanted a relaxing, safe place to stay.....yet only a bus ride away from the 'excitement' of PV! We enjoyed our stay immensely! From watching the fish, stingrays and dolphins right off of the deck to swimming in the pool. This property is very clean, perfectly located and very comfortable. Thank you! Thanks for the great review - I've never seen stingrays below - how fun! Overpaid for this condo, and having TERMITES did not help the stay of 5 weeks! Upon arriving at the condo the place needed a good cleaning so when I called for maid service they said I needed to wait until Tuesday because that was her cleaning day! So no I DID NOT LOVE IT! I have been in Mismaloya for about 15 years and this is the first time I felt I overpaid for such low class conditions. Really relaxing spot. Loved watching the fish below our balcony! Thanks for your note, Natalie. We're glad you enjoyed your stay. Mismaloya is a quiet lovely area with great views. NO NEED TO LEAVE YOUR BALCONY!! Just back from a fabulous stay in this great condo, and have dozens of pictures to affirm this condo's great location within the complex. Iguanas in the tree canopy, fish galore in the waters below, birds entertaining us with their antics, boats heading out/coming back from their latest adventures, various other ocean & beach activities, including folks visiting the site of the Night of the Iguana movie set..... There's no need to leave your balcony if you've got your camera & binoculars! If you do feel the urge to join the fish, just don your snorkel gear and explore, without leaving the bay! When venturing into town, just hop on the local bus (8 pesos each, one way); cabs, too, are always an option. Stroll into the village of Mismaloya to buy most of your provisions; you'll be surprised at the variety available! A nearby stand offers fresh fruit, at a reasonable price. Speaking of food....the "Mismaloya Grill" is located on the condo property. Enjoy a tasty dinner without leaving home. Having stayed in a different building, on a prior visit, my husband and I agree that we prefer this condo's location, despite the lack of elevator. Folks with mobility issues might be challenged at times, however. and the well-provisioned kitchen made 'eating in' a pleasure. Mexican artwork adorns the walls; colourful and a nice touch! Living-room furniture was comfy and yes, TV in English, and free Wi-Fi are rather nice. The bedroom is very spacious, with lots of storage. The king-size bed was a tad firm but we soon got used to it! The entire complex, including the pool and pool deck, received a major renovation and upgrade during this past summer. Now the complex is 'accessible', for the most part, and features 2 fountains, painted and mosaic murals, and 2 new 'palapas'.....providing much needed shade. Well done! 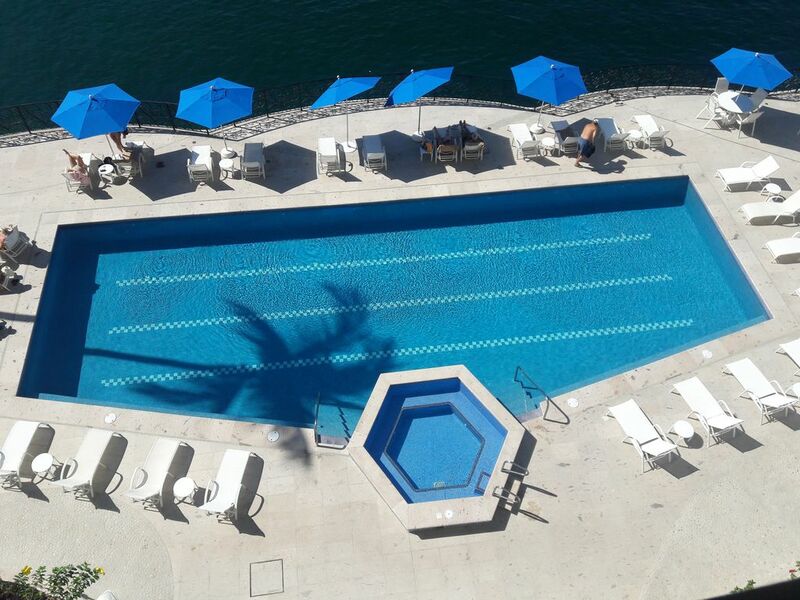 The staff at "La Jolla de Mismaloya Condominio" was as great as ever......helpful, friendly, and easy-going. Booking our 5 week vacation was very easy; Amy answered our emails within a few hours, at most. Thank you! How much did we enjoy our stay? So much so that we're already booked for next year! Thank you for such a nice review and helpful tips. The onsite restaurant Mismaloya Grill, will also do grocery shopping for you. In fact they will prestock the kitchen as you wish. I asked for a price, it was 200 pesos to do light shopping. At today's rate, 200 pesos is $11 USD. Sounds like a bargain. The other thing you can do is bring breakfast items along on your trip for the first night, and then go to Costco, WalMart, Sam's Club, Mega Comercial or Soriana the next morning.